Google Reader Alternatives? | Sci-Ence! Justice Leak! Further Update HiveMined appears to be a replacement, although it’s still in closed beta. Go there and sign up to be notified when it opens up. First, apologies for the lack of posts over the last few days. I’m still not very well, and the little time that I currently have for this kind of thing has been spent proofing and indexing the Monkees book (which should be out soon). I’ll have the next Bigger On The Outside post up soon though. But I wanted to ask – does anyone have any suggestions for an alternative to Google Reader? 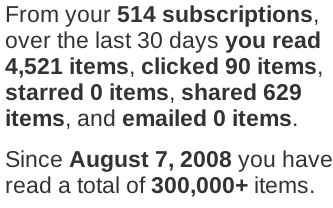 For those who don’t know, Google Reader is the social network I’m actually most active in, in its weird non-social way. Google Reader is an online RSS feed reader, but it also allows people to share articles with their friends, and to comment on things they or their friends have shared. So to take an example from last week, my friend Chris might be reading an article on a Muppets site whose feed he reads, and click ‘share’. That lets me see that article without having to read the rest of the feed and then I might reshare that article just to my friends. Then my friend Eve might comment on it, a comment which everyone who can see the things I share can also read. However, as of next week, Google are going to remove all the social functionality from Google Reader. Now, if you share something in Reader, it will go to your Google Plus profile instead, and if you want to see what everyone else is sharing, you’ll have to look at their Google Plus profiles. This, to me, removes at least half the reason for using Google Reader. Yes, I want to be able to keep up to date with the 514 websites I’ve got there (though in truth I only look at about half of those with any regularity. But I also want to be able to say to my friends “Look at this interesting thing I just found!”, and I want to find out about new stuff that my friends think I’d like. Sharing on Google Plus isn’t the same, because there it’s mixed up with all the other stuff – people’s personal lives, memes, lolcats and what have you. I find these things harder to deal with than shared articles. Those of you who know me know that I often don’t have the mental energy for socialising, even online, as my huge pile of unreplied emails will attest. I often have to avoid Facebook, Twitter and Google Plus for weeks on end. I never have to avoid Google Reader. Mixing the two doesn’t help. Also, of the small number of people whose feeds I read on Google Reader, only one has added me on Google Plus, and I suspect the majority don’t want a Plus account. Being able to share with Mike Nesmith and someone I used to know on a mailing list ten years ago, as I can on Google Plus, doesn’t really make up for being unable to share with my wife, or some of my other close friends. I also like the ‘share’ function because I can use it in the way others use del.ici.ous or similar sites – as a set of personal bookmarks which I can then use for my linkblogs. So does anyone know of another online RSS reader that allows you to share items with a specified list of people, who will see it within the reader (not through Twitter or whatever) and for you to see what they’ve shared? It’d be nice if there was something like the Note in Reader bookmarklet, too. I can’t find anything like this online, but surely there must be one? It’s such a simple set of functionality, I would imagine a competent coder could hack something similar together in a couple of days, so I can’t see why there *wouldn’t* be an alternative out there. This entry was posted in Uncategorized and tagged google reader. Bookmark the permalink. 18 Responses to Google Reader Alternatives? Well, I wouldn’t know where to start — I’m still trying to find a good alternative to Google search. And Dropbox, now that I think of it. Not suggesting you don’t mean it! Only that it could be sarcasm, but I can’t tell if it is. I have no problem with them introducing a ‘share to google plus’ feature – I just have a problem with them removing the features I actually use. Before there was Google Reader, Bloglines was the web-based feed reader with the most to offer. Have you checked to see if they’ve added any sharing features? According to Wikipedia the site no longer exists. You can actually get something if you visit it, but it seems impossible to sign up for it. From what I can tell Netvibes is more like iGoogle or Yahoo or something than Google Reader. It’s a ‘portal’. And the sharing features cost a lot of money – I could afford them, but most of the people I share with on Google Reader couldn’t. Thanks for the suggestion though. I did not know you used Google Reader that way; I don’t think I’ve even got you ‘followed’ on Reader. Huh. Little late to find that out. You used to follow me on there, but are one of several friends who’ve unfollowed me because I share too much. Yeah, I use it as a straight RSS reader. I’d forgotten just how much you do share. Thanks for having a better memory than me. And just in case you didn’t care about the social features, they made the UI nice and ugly too. I know I hate color. Thanks, Google! Pingback: Top Posts Of The Year « Sci-Ence! Justice Leak!